How much does the average person have saved for retirement? Find out if Americans are saving enough for retirement. The 2018 Retirement Savings survey found that 42 percent of Americans have less than $10,000 saved. If they don’t boost their savings, they’ll likely retire broke because that’s not enough to cover a year’s worth of expenses. On average, adults 65 and older spend almost $46,000 a year, according to the Bureau of Labor Statistics. 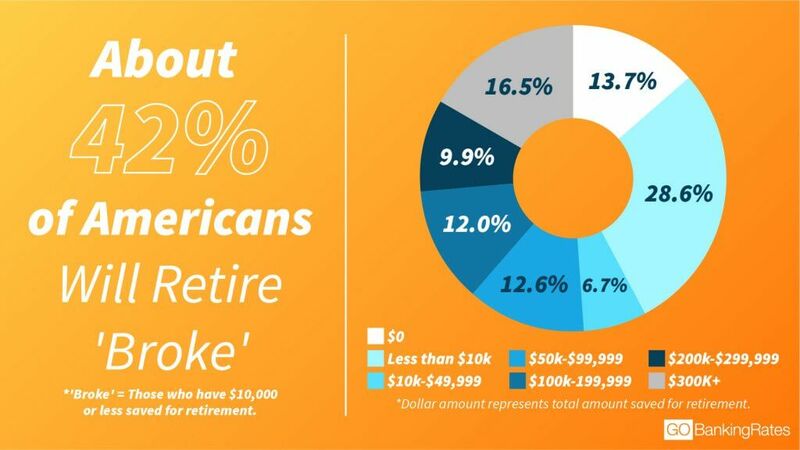 Included in that 42 percent with less than $10,000 saved is the 14 percent of respondents with absolutely nothing saved for retirement. This group could be at the most risk of retiring broke if they don’t start taking steps to catch up on retirement savings. Q: By your best estimate, how much money do you have saved for retirement? Men are still more likely than women to have larger retirement account balances. The 2018 survey found that 45 percent of women have no savings or $10,000 or less, compared with 40 percent of men. However, that’s an improvement from 2017, when 58 percent of women had no savings or less than $10,000 saved. In 2016, 63 percent of women had less than $10,000 saved or nothing at all. It’s not surprising that the youngest generation (millennials) is more likely to have less in savings than older generations. At 18 percent, millennials ages 18 to 34 have the highest percentage of respondents with $0 saved. 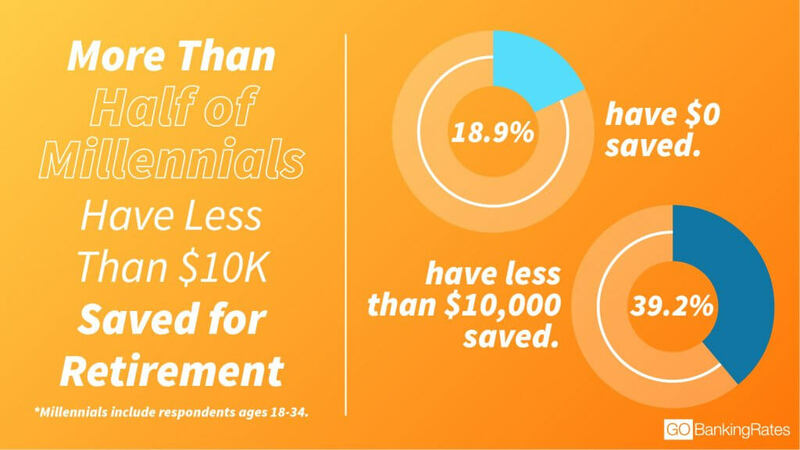 And another 39 percent of respondents in this age group have less than $10,000 saved. However, about one-third have less than $10,000 saved. That means these baby boomers need to catch up on retirement savings if they won’t have other sources of retirement income beyond Social Security. The most common reason respondents gave for not saving for retirement was “I don’t make enough money.” About 40 percent chose this response. The second-most common reason for not saving was “I’m struggling to pay bills,” with about 25 percent of respondents choosing this answer. 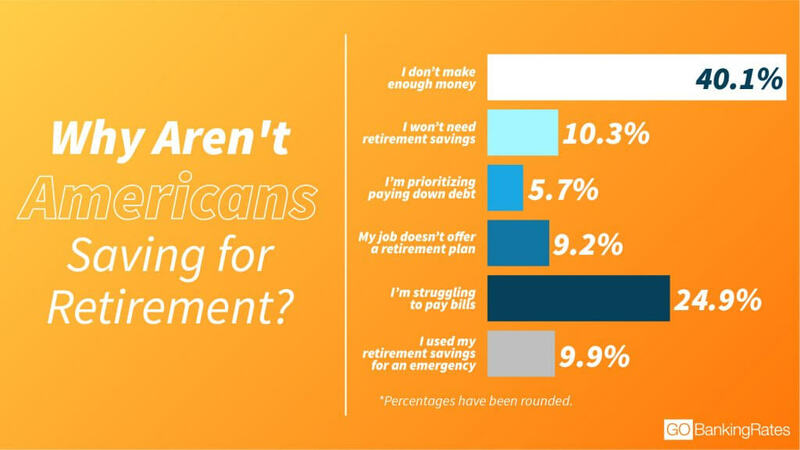 About 10 percent of respondents said they wouldn’t need retirement savings, they used their savings for an emergency and their job doesn’t offer a retirement plan. The least common reason for not saving for retirement was prioritizing paying down debt. Meanwhile, women are more likely than men to say that they aren’t saving for retirement because they don’t make enough money — 43 percent versus 36 percent. This helps explain the gap in retirement savings between women and men that our other survey found. Women also are more likely than men to say that they aren’t saving for retirement because they’re struggling to pay bills — 27 percent versus 23 percent. However, they are less likely than men to say that they won’t need retirement savings, that their job doesn’t offer a retirement plan or that they had used the money for an emergency. Q: Which is the main reason you do not have any retirement savings? Although the top reason for not saving among all age groups was not making enough money, millennials ages 25 to 34 were more likely than other generations to say they don’t have retirement savings because they’re prioritizing debt and their job doesn’t offer a plan. Baby boomers ages 55 to 64 are more likely than other age groups to say they aren’t saving because they are struggling to pay bills, with 27 percent of respondents in this age group choosing this answer. Gen Xers ages 35 to 44 are more likely than other age groups to say they’re not saving because they won’t need retirement savings. And adults 65 and older are the most likely to say they don’t have retirement savings because they used the money for an emergency. What’s even more encouraging is the decline in the percentage of Americans with $0 saved. In both 2016 and 2017, the percentage of Americans with nothing saved was more than twice of the approximately 14 percent with no savings in 2018 — 33 percent and 34 percent, respectively. You might not be making retirement savings a priority because you don’t realize how much a comfortable retirement will cost you. You can find free retirement calculators on the websites of investment firms such as Fidelity and Vanguard. If you have a retirement plan at work, the plan administrator might even offer a retirement calculator. Financial planners typically recommend saving 10 percent to 15 percent of your income annually to save enough for a comfortable retirement. If you’re not setting aside this much, review your spending to see what nonessential expenses can be cut so you can boost retirement contributions. And don’t forget to increase contributions with each pay raise. If you don’t have a workplace retirement plan, you can open an IRA or Roth IRA through an investment firm such as Fidelity, T. Rowe Price or Vanguard. If you’re self-employed, you can save for retirement with a SEP or solo 401k, which also can be opened at an investment firm. But, if you’re already close to retirement age and don’t have much saved, you can stretch your retirement savings by working longer. Other options include getting a part-time job in retirement or relocating to a place with a lower cost of living — perhaps even outside the U.S.
Find out how long $1 million in retirement will last you in every state. Methodology: The GOBankingRates survey posed the question, “By your best estimate, how much money do you have saved for retirement?” Respondents could select one of the following answer options: 1) “Less than $10,000”; 2) “$10,000 to $49,999”; 3) “$50,000 to $99,999”; 4) “$100,000 to $199,999”; 5) “$200,000 to $299,999”; 6) “$300,000 or more”; or 7) “$0.” Responses were collected through three separate Google Consumer Surveys conducted Feb. 6-9, 2018, and responses are representative of the U.S. online population. Each survey targeted one of three age groups: 1) ages 18 to 34, 1,001 respondents; 2) ages 35 to 54, 1,001 respondents; and 3) age 55 and over, 1,003 respondents. An additional survey was conducted to target people who have no retirement savings and find out why. A screener question was used to collect responses only from 1,000 respondents who said they do not have retirement savings. Respondents were then asked, “Which of the following is the main reason you do not have any retirement savings?” Respondents could select one of the following answer options: 1) “I don’t make enough money to save”; 2) “I won’t need retirement savings”; 3) “I’m prioritizing paying down debt”; 4) “Job doesn’t offer a plan”; 5) “Struggling to pay bills”; or 6) “Used money for an emergency.” Responses were collected by a survey conducted Feb. 6-9, 2018, using Survata. Survata categorizes the ages of their respondents in the following groups: 1) 25 to 34, 2) 35 to 44, 3) 45 to 54, 4) 55 to 64, 5) 65 and over. Moving to a tax-friendly state can save you money in retirement.